Not too far from downtown Boulder, Colorado, lies a permaculture-based farm. I arrived as Amanda Scott was eating lunch outdoors with a couple of employees. They were savoring portions of a gorgeous casserole brimming with veggies and a good-looking sauce. If their lunch is any indication, 63rd Street Farm is conducive to both health and happiness. After just a few minutes of conversation, I start to realize that this farm is really about growing food in order to build community. The farm itself uses organic practices to cultivate vegetables on a couple acres of land. They also raise organic, non-GMO fed chickens for meat and eggs. This feeds a 150-member CSA (Community Supported Agriculture). But not on its own. They have a mini-vineyard that we passed on our way in. A Boulder company, Settembre Cellars overseas the vineyard and sells their hand-crafted wine through the CSA. You can add Sawhill Ranch hormone-free, grass-fed beef to the weekly basket. If you want to volunteer at the farm, they have a spot for you. The 63rd St. Farm partners with the Boulder campus of the Escoffier School of Culinary Arts. Escoffier students gain hands-on experience and appreciation of the farming activities necessary to grow food. During my visit, a group of students was planting tomatoes, under Amanda's supervision. By connecting with the farm where their ingredients come from, these future chefs acquire the knowledge to make better sustainable ingredient choices down the road. 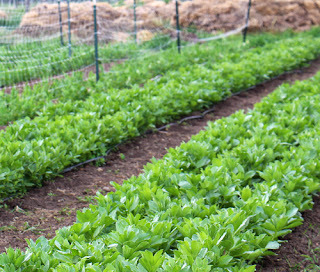 A local chef partners with the farm to offer Seed-to-Table dinners at the farm. The farm houses an indoor mushroom laboratory and grow-space, operated by Boulder High Country Mushrooms. Every week, the CSA itself brings people together. Rather than just having a pick-up point, they make it a party. At least, that's what it sounds like. There's live music, homemade pizza, and the local Boulder wine to wash it down. If a member misses the weekly pickup, their weekly share of food is donated to EFAA, a local food bank. Lest you think 63rd St. Farm is primarily a benevolent enterprise, rest assured that by connecting with others engaged in sustainable production, the farm is creating additional streams of income. Amanda explains that even with these additions, she and her husband, Brian, could not get by solely on the farm income. It would be sufficient to support Amanda. But Boulder is expensive by Colorado standards, and Brian's off-farm employment is necessary to ensure the couple's financial well-being. In a land with so little rainfall, I had thought the biggest issue facing a farmer east of the Rockies in Colorado would be water availability. My initial questions about water conservation on the farm evidently showed my total ignorance about how water is allocated in this part of Colorado. In fact, Boulder is blessed with a network of irrigation ditches. They flow for about half the year. Water from the mountains flows down through the city into these ditches and on to fields, pastures, orchards, and gardens. The water in a ditch belongs to a ditch company, which is owned by shareholders, who have rights to specific amounts of water at specific times and who pay for the ditch’s upkeep. 63rd St. Farm owns twelve shares of the North Boulder Farmers Ditch. 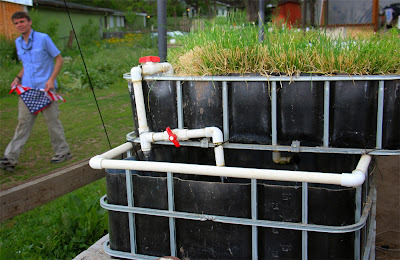 This gives them access to most of the water they need during the growing season. If they run out, they have a supplemental well. The farm's water situation is adequate for now, but the future might bring trouble. In some areas of Colorado, seepage from ditches has built up the groundwater reservoir over the last 150 years. Water from this groundwater reservoir flows back into waterways further downstream and supplies ditches further away. Right now farmers in Colorado use far more water than anybody else, but, as evidenced by the groundwater buildup, it is water that stays in the hydrological cycle. The reverse could also take place. As I see it, due to less snow, more drought, and climate chaos, anything that removes a large chunk of water from the hydrological cycle could be problematic down the line. Consider fracking. In 2009 the Groundwater Protection Council reported that “The amount of water needed to drill and fracture a horizontal shale gas well generally ranges from about 2 million to 4 million gallons.” Colorado state officials told the Denver Post that about half of it is injected into the earth, not to return. What does return is contaminated and can't be cleaned at a reasonable cost. But Amanda explained that shares in ditch companies can be bought and sold. Her biggest worry about water availability is that farmers might have to compete with frackers, when ditch shares come up for sale. And there really is no competition there. With far, far deeper pockets, frackers are likely to take it all. 63rd St. Farm relies primarily on human labor rather than machines. But Amanda sees room for improvement. They use a tractor once a year, but Amanda wants to eliminate its use entirely. The farm is replacing some tractor tilling with pig-tilling and chicken-clean-up. This reduces fossil fuel inputs to the farm. Deep cultivation with a tractor can decrease organic matter in the soil over time. 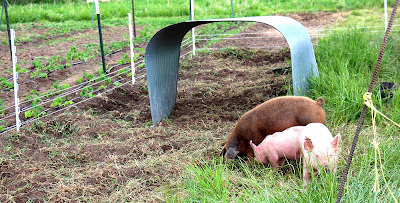 By contrast, if the pigs don't hang around in one spot too long, they will add manure to the soil without compacting it. During my visit, some very cute pigs were taking care of a bed of thistle. Once the pigs are done, chickens follow up by weeding what remains and eating insects. This will potentially reduce pest pressures. Currently, all bug problems are controlled by hand, for example squashing squash bugs and pinching bean beetles. I assume that pigs will destroy the beneficial fungal networks and earthworms, just as tractors do, but with some additional awesome benefits. Pigs and chickens should mean less fertilizer inputs, less hand-weeding, less hand bug-killing, and fewer beneficial insect inputs. Amanda is outspoken in her criticism of government intervention in private business. For example, to be certified organic, there is a requirement to wash all produce with a diluted chlorine solution - one part chlorine to ten parts water. This does not fit with most anyone's definition of organic, and yet according to Amanda, it is indeed part of the requirements. I pressed her on that point, since I had not come across any farmers who were required to do this. Amanda readily admitted that this mandate only applies to farms with over half a million dollars in revenue. Here's hoping that the 63rd St. Farm will achieve such earnings. It comes as no surprise that Amanda has not sought organic certification. Rather, the farm has pursued the Certified Naturally Grown label. I love Amanda's willingness to research and try out different sustainable systems. I couldn't help but notice the bales of straw lined up along the perimeter of the cultivated field. She is testing straw-bale farming. Her plan is to grow squash. At full price, straw bales might not be a profitable experiment. However, Amanda purchased "ruined" bales, which had gotten too wet for their intended use as animal feed. Rather than $6/bale, she paid $3. The farm also includes an aquaponics setup. 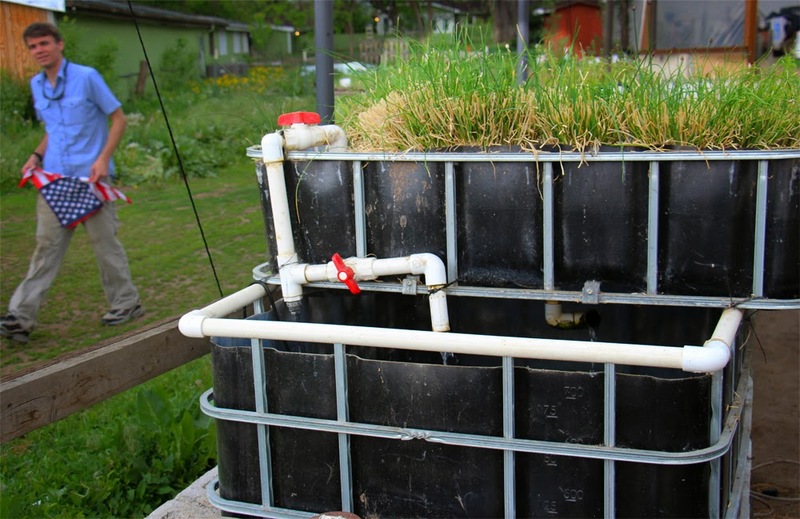 It is a closed loop system with the fish waste fertilizing the plants and the plants helping to clean the water for the fish. As Amanda pointed out, the energy part of the equation does not fall within a closed loop. The pumps run on electricity. She intends to help close the energy loop, by installing solar panels to generate electricity. During my self-guided tour of the farm, I also discovered a small food forest that Amanda had not even mentioned. 63rd St. Farm has found a myriad of exciting ways to integrate the permaculture ethics of earth care, people care and fair share into a working farm. If you live in the Boulder area and want to pick up organic veggies every week from the 63rd St. Farm CSA, you can call them at 720-938-3059 or email them at info@63rdStFarm.com to sign up for the 2015 season.